Egalan Review 2019: Is Egalan a Good Hosting? Spanish web hosting provider Egalan offers inexpensive hosting along with additional web design and logo services. Egalan and Egahost Internet (let’s go with simply Egalan) is a privately-owned company established in 2006 with the purpose of providing web design, web hosting and positioning services in Spain from its Spanish language website. This provider’s main hosting options include VPS hosting, colocation, dedicated servers, and shared hosting. The shared hosting is powered by the Plesk control panel that provides an easy and intuitive interface for beginners to manage their web spaces without any technical expertise. The basic Linux package comes with 200 MB of data, 3 GB bandwidth, and an auto-response email service. The Windows packages come with 4 GB to 8 GB of storage and unlimited data transfer. Other value-added services provided by Egalan include dedicated servers, virtual servers, domain services, and web design. Creating websites can be cumbersome for non-techies, but not with Egalan which provides you with a “Web Presence Builder” website builder with every plan. It helps you create and publish professional websites with no technical knowledge. I couldn’t find any specific uptime for shared hosting plans, but I can tell you that this company’s dedicated servers come with a 99.9% network SLA. Due to the lack of complaints online, I assume that the shared hosting plans are equally reliable. Egalan appears to understand customers’ needs for powerful, advanced hosting at inexpensive prices. Of the Linux and Windows plans (four of each), the basic Linux plan is really cheap compared with the primary competitors. As is usually the case, the Windows packages are more expensive than the Linux ones. All hosting plans are offered with only annual billing periods, which is quite restrictive and requires a little leap of faith in the absence of any money-back guarantee. You can pay for plans by credit card, PayPal or wire transfer. You can contact Egalan by telephone or ticket. The company advertises 24/7/365 technical support with super-fast responses, but this evidently doesn’t apply to me as a prospective customer because I received no reply to my submitted ticket. If you want to try supporting yourself, you can click the knowledge base link that leads to a categorized list of FAQs. Egalan has secure, stable servers in Spain. Having assessed its hosting services, I’ve ascertained that the features of its hosting plans are easy to learn, understand and use. For Linux or Windows hosting on Spanish servers, go to Egalan. 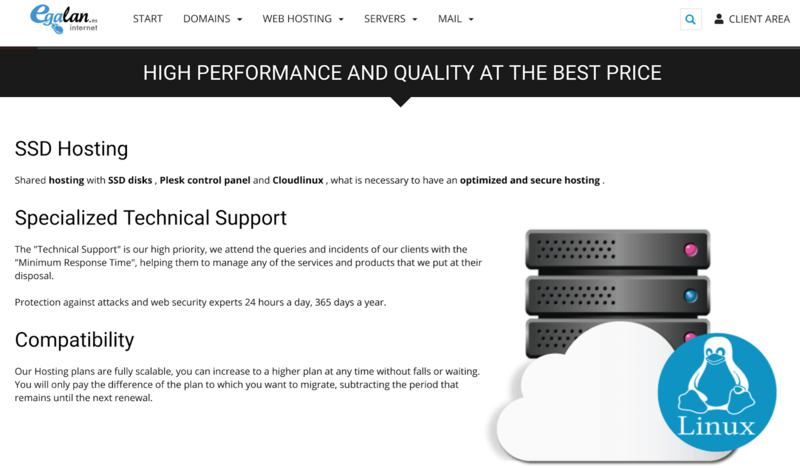 Wondering how Egalan stacks up against other Web Hosting companies? Enter any other Web Hosting company and we will give you a side-by-side comparison.